It’s difficult to work in the backyards or the garage without music, primarily when you are working alone. Whether you are repairing your car or doing some DIY projects, you need a soothing environment to work calmly & efficiently, and music plays a significant role in creating such surrounding. A boom box or a specially designed workshop radio can help you to listen to your favorite stations and songs. But, how can you choose the best job site radio from a plethora of devices? Well, to help you in that, I have filtered the list of the most sought receivers for work in garage or workshop. Let’s have a look. 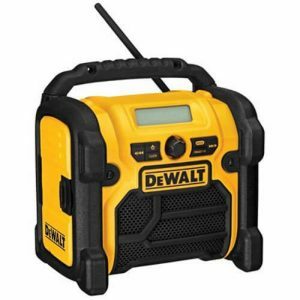 Whether you are working in your garage or enjoying your weekend camping at somewhere at a remote place, this small job site radio from DEWALT will entertain you for sure. This device is available in six different styles to let you choose your favorite one. You can run this portable radio on either 20V, 18V, or even on a 12V battery pack. It comes in a protective box which saves the device from the dust, debris, and from any accidental damage. It has an auxiliary input of 3.5mm which you can connect with satellite, MP3, CD receivers. You can operate it on both the AC as well as DC power with the compatible DEWALT power batteries. This radio can also be charged through a USB port when you plug it in the wall outlet. This compact radio from Sangean comes with industry-leading features to entertain you at the job site. 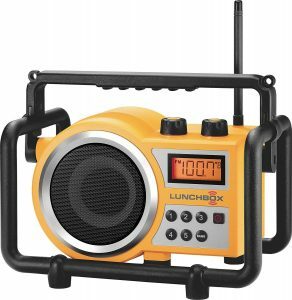 The LB-100 lunchbox includes a digital PLL tuner and an antenna which provides a better reception of the received signal. The industrial grade build of the radio makes it resistive against shock, dust, and rain. It comes with an AC power cord with 9 feet length which you can wind up on the backside of the device for avoiding damage. 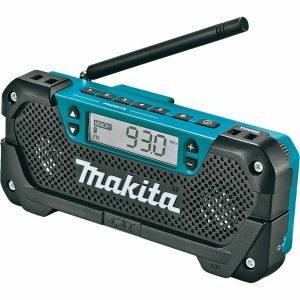 This worksite radio can be preset to the total 10 radio stations including 5 FM stations and 5 AM stations. It has a roll cage design which protects the radio device from the damage due to accidental drop while making it extremely portable. An easy to read LCD helps you to see the current playing station and time. The 5-inch sized speaker is waterproof and delivers a powerful sound output. 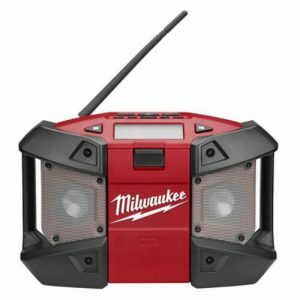 From Milwaukee, you will get the powerful portable radio to get a musical environment at your workshop or garage. It is built with an ABS Polymer & steel material to provide shock resistivity and durability. This radio is easy to use & provides high reception with clear signal quality. You can power it up through an AC wall adapter or two AAA batteries. It is compatible with all standard batteries and chargers. Though this cordless radio has almost ten times smaller design than other standard garage radios, it delivers dominant performance. It comes with waterproof speakers and weather-sealed MP3 section. You will get 5-year company warranty for this device. 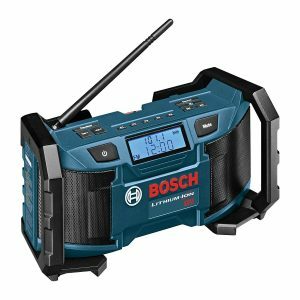 The PB180 from Bosch is a compact yet powerful job site radio. It has such a lightweight and small design that you can carry and store it anywhere easily. Now, you can more enjoy your work at the garage or workshop while listening to your favorite songs and radio channels. It comes with two Nd (Neodymium) made speakers of 5W to deliver soothing sound clarity. The shock-absorbing build keeps it completely functional even if you accidentally drop it from the height of two meters. You can preset up to 10 FM or AM radio channels as per your interest. It has an MP3 player connection port to help you listen to your favorite music from your device. You can run this 18V radio on the 4A battery for up to two days. The 360-degree rotating of the 7” antenna provides maximum signal reception. With the weight of only 4.1 kilograms, it is one of the lightest garage radios out there. Why work boringly at a job site when you can have a compact music companion with you? The P746 creates a musical environment at your worksite to help you finish your job delightfully. You can power it up from the wall outlet and can run it on the batteries too. It has two 7W speakers which provide clear & loud noise. You can attach the extra speakers for more entertainment though. You can preset 10 different AM or FM radio channels to listen to your favorite station on the go. It comes with a built-in audio equalizer which allows you to adjust the treble and bass as per your mood. Other than the AM/FM stations, you can connect your MP3 player, smartphone, and other compatible devices through the port or via a Bluetooth. At the top, it has a stand to hold your phone, table, or other small devices. 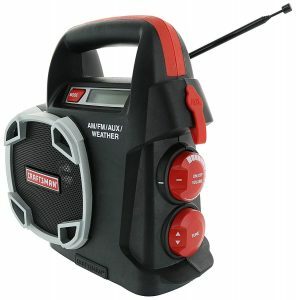 This portable garage radio from Craftsman will help you listen to your favorite radio channels, weather updates, and MP3 songs whether the power is on or off. You can carry it at your job site on the top of the building or in the basement; it will deliver superior performance all the time. It supports the FM bands in a range of 87.5MHz to 108.0MHz and the AM bands between 520KHz and 1710KHz which means you can listen to your any favorite station. It includes an auxiliary port to connect the MP3 player, smartphone, or a laptop to play songs from it. This radio operates on a single 19.2V battery which can last for hours. It is built with Polyurethane material which makes it sturdy and durable. This device is easy to take anywhere thanks to its carrying handle. The RM02 from Makita is a cordless garage radio which delivers dominant sound performance. This job site radio is compact and compatible with different MP3 players, smartphones, iPods, and other music devices. 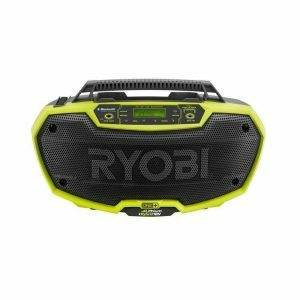 You can use this job site radio through a 4A battery which can last up to 30 hours. It comes with 10 preset buttons to save your favorite AM/FM stations. This device comes with an earphone port allowing to listen to music without disturbing others. The front two speakers deliver powerful and clear sound output. It has only 1.7 lbs. of weight. It is built with a rotating hook to keep it at a convenient place. This garage radio comes with three years of manufacturer warranty. Are you restoring your car in the driveway? Do you work in your garage for hours? Then, you should pick a quality job site radio to have a soothing musical environment. But, how will you decide which is the best portable radio for you? Especially when all the filtered devices have the same essential functions? Well, it is not as difficult as you think. First, decide which place do you need the radio; is it a garage or a driveway or a rooftop job site? Then, think of the sound output you love to hear; whether you love to listen to loud or soothing music? You also should consider the types of audio inputs the radio comes with like a CD, MP3 player, auxiliary input, or anything else to connect your mobile device. At last, check the price of the job site radio and match it with your budget. If all these things accomplished, then you have found your perfect worksite radio. Let the world know about your choice. 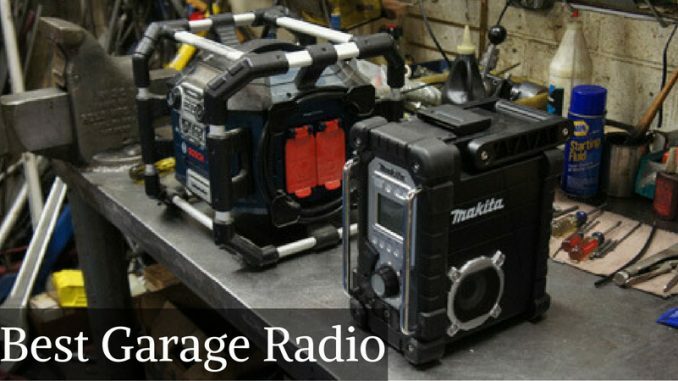 Mention your favorite brand and model of the garage radio in the comment section below.